First of all, my question is extremely similar to this, this and this. The Android documentation for what I'm trying to achieve is here. I couldn't get this to work using these resources so please don't mark this as duplicate as it is not. I have a website and an Android application. The user will be able to scan QR codes that contain links like http://mywebsite.com/map/. When the user tries to open this link, I want Android to show him a chooser dialog where he can choose to open that link using my application. If my application is not installed, it should proceed to the specified website. Also, I have tried adding android:mimeType="text/plain" to data but it didn't help. The problem is that when I go to http://mywebsite.com/map or http://mywebsite.com/map/ Chrome just opens the webpage without showing the chooser dialog. Notice that in your case, you would need to use android:pathPrefix instead of android:path. Just to be sure, you should reset the preferences for your app in case you have accidentally set it to always open the link in chrome rather than show the chooser dialog. Once "Always" is used to open the matching uri, it will never show the chooser. 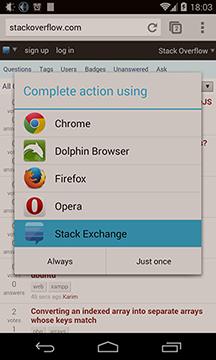 See here for more details How do I open any app from my web browser (Chrome) in Android? What do I have to do with the A Href link? Note that with this method if the app is not installed the user will be taken to the Google Play store for the specified app package. You can search with chrome / etc android browser'search box like example then open chosen dialog ..!! How to open application in mobile on click of a link? How do I open any app from my web browser (Chrome) in Android? What do I have to do with the A Href link?